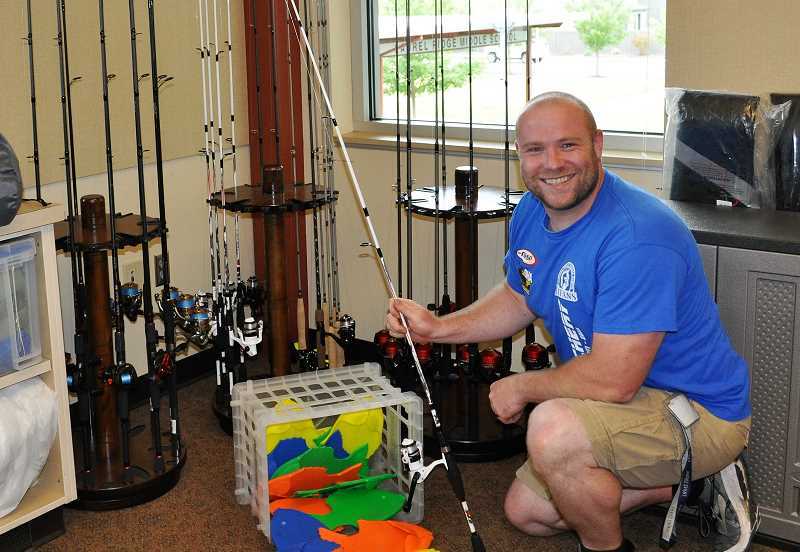 Laurel Ridge teacher Travis Simpson gives families free access to fishing supplies. As part of the wild edible food unit in Travis Simpson's outdoor living class at Laurel Ridge Middle School, students spend an hour one day gathering walnuts. Then they spend an hour the next day cracking and shelling the walnuts. Then Simpson dries the nuts with his dehydrator. "By the end of that, we have 65 kids in the class, and they've spent two hours of work each, so that's over 120 hours of total time spent for the entire class, plus all the drying time," Simpson said. "At the end of it, they get a cup and a half of walnuts each. So you get to see how much work it would take if you don't have the modern-day machines to do all that work for you." That experience teaches a lesson that is pivotal to Simpson's elective class: Exploring nature is difficult. But the results can be quite rewarding. When Simpson's students start the school year, their familiarity with outdoor living can be "across the board." Most families go camping or fishing once or twice per year, but not many kids know how to use survival bracelets, or a compass, or make their own three-dimensional map, or pick the raspberries that grow on their own school campus each summer. Simpson's class, inspired by his friends' program at Stanford University, covers all of that and more. "The whole goal of outdoor living is for kids to get their hands dirty and get them thinking about these activities," said Simpson, "so they can walk out of the classroom and have these experiences and hobbies that, later in life, they can pursue." Simpson, a gentle giant of a man, speaks from experience. He remembers being tricked into taking a home economics class in high school. But his teacher was an expert outdoorswoman, and she applied each lesson to survival skills. "We learned how to cook, we learned how to sew, but everything was based around the outdoors," he said. "I still know how to sew because of that class." Now, Simpson is taking the approach he uses in his class —give kids a solid basis, so they can explore their outdoor interests with confidence outside the classroom — and extending it to all of Laurel Ridge Middle School. Thanks to a grant of about $2,000 from the Salmon and Trout Enhancement Program, Travis recently launched a "Lending Library" in his classroom. Every Laurel Ridge family can check out up to three fishing poles for up to two weeks at a time. The poles also come with lures and an informational brochure. And it's all free. "The biggest reason for me to get this equipment was so that they could eliminate that barrier to entry," Travis said, noting that fishing poles and other supplies can be expensive for first-time fishers. "I wanted them to have this resource free of charge, so they could try it." 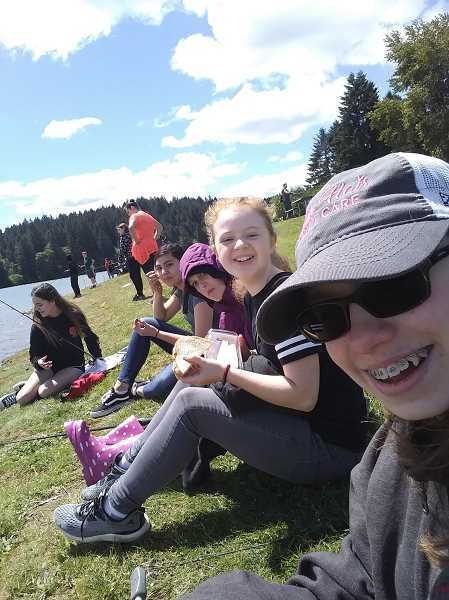 The idea for the Lending Library came after Simpson took his own kids on a fishing field trip to Hagg Lake. "It's just a blast to have a school-sponsored field trip where kids can just go fishing for the day with their friends," he said. "It's really stinking awesome. … But watching the kids, I knew they needed more time. They needed more than a day or two of casting to actually feel competent." Simpson plans to someday extend the Lending Library throughout the Sherwood School District. And he hopes to take his kids on an overnight camping trip eventually. The more experience he can give his students, the better. "I pray that 10 years from now when they have the time," Simpson said, "they can look back and say, 'I've already done that. And I want to do more of it.'"